A Sudden Light by Garth Stein was an entertaining novel from the author of the excellent 2008 book The Art of Racing in the Rain. This latest effort from Stein is set in his home city of Seattle about tells a story of family, secrets, ghosts and big choices made by the book's 14-year-old narrator. 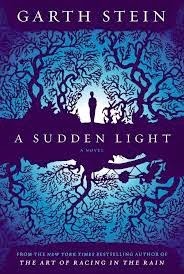 I don't know I found myself terribly happy with the ending (as opposed to the writer of this Seattle Times review of A Sudden Light who found the finale "immensely satisfying"), but I thought the book an interesting and at times poignant read.